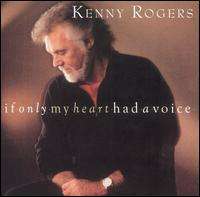 If Only My Heart Had A Voice is the twenty-fifth studio album by country music superstar Kenny Rogers. It was Rogers' first album released on the Giant Records label. However, Rogers had been signed with its parent company, WEA, since 1989. The album was Rogers' first since 1976 not to chart. "Ol' Red" was also recorded by George Jones on his 1990 album You Oughta Be Here with Me, and would later be a Top 20 hit in 2002 for Blake Shelton from his self-titled debut. "If I Were You", recorded here as a duet with Travis Tritt, was originally cut by The Oak Ridge Boys on their 1991 album Unstoppable, and would later be recorded by Chad Brock as a duet with Mark Wills on Brock's 2000 album Yes! Rob Theakston of Allmusic rated the album 2.5 out of 5 stars, saying that "there are some moments on here that die-hard fans will enjoy". He thought that the production had "aged well" and that the songs were "surprisingly consistent." Travis Tritt - duet vocals on "If I Were You"
↑ Theakston, Rob. "If Only My Heart Had a Voice". Allmusic. Retrieved 2 June 2014.